As Washington Wizards guard Bradley Beal raised his fist in the air while also picking himself off the floor after being hacked on a fast-break layup, teammate John Wall went into full celebration mode at the other end of the court. Wall broke out into a rhythmic clap that would have made the members of any Baptist church proud, and then popped his jersey as he walked the baseline not far from the Boston Celtics’ bench. Beal had his best game of the series, scoring 29 points while hitting 11 of 16 shots. It took a while for Wall to get started, but after missing his first nine shots, he finished with a brilliant stat line (27 points, 12 assists and 5 steals) in Sunday’s 121-102 win. Through the first four games of the Eastern Conference semifinals, Washington has appeared to be the better team. If the Wizards hadn’t blown big leads in the first two games (they scored the first 16 points in Game 1 and had a 13-point first-quarter lead in Game 2), they’d likely be up in the series rather than tied 2-2. But the Wizards have yet to win a game in Boston this series and will need a victory there to advance to the next round. And to do that, Wall and Beal will have to play like the best backcourt in the NBA, a level that both have long claimed they are at. That defense doesn’t work if the Wizards don’t stay true to their scout of the Celtics: to slow Isaiah Thomas. Thomas, who has been tremendous facing difficult circumstances, came out hot and scored 17 points in the first half. Then he got stifled. He had two points in the second half. Beal had success in the first quarter overpowering Thomas in the post. Beal said the Wizards’ plan was to be physical with Thomas and to take him out of the game. And taking him out of the game meant staying attached to Thomas, denying him the ball on the perimeter and keeping a defender on him continuously at the 3-point line and beyond. In the adjustments after the hot start by Thomas, the Washington player assigned to him never sagged as a help defender. Thomas blamed the way the game was called, saying he was whistled for fouls on one end while not getting the benefit of calls on the other. Thomas didn’t attempt a free throw for just the fifth time this season, an oddity for a guy who was seventh in the league in free-throw attempts. That led to frustration for Thomas, who got a technical foul in the second half during a back-and-forth chatfest with Beal. It was an extension of the physical play in a series between two teams that don’t like each other. The series shifts back to Boston on Wednesday, and Thomas says he wants to see his teammates shake off some of the disturbing trends he saw in the two losses in Washington. In other words, take a lesson from Wall and Beal. 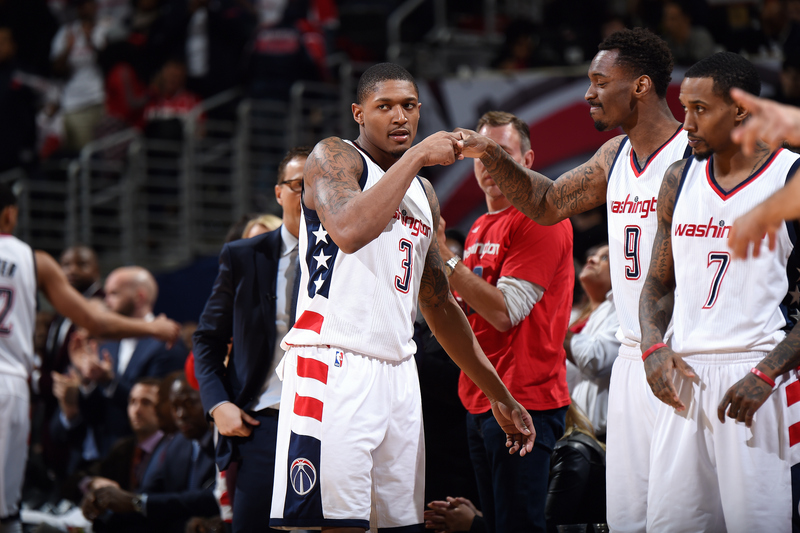 Bradley Beal #3 and Sheldon McClellan #9 of the Washington Wizards fist bump each other during the game against the Boston Celtics during Game Four of the Eastern Conference Semifinals of the 2017 NBA Playoffs on May 7, 2017 at Verizon Center in Washington, DC. Beal had two subpar outings in Games 2 and 3 (he shot a combined 8-of-27) and hasn’t really dominated as he did in the first-round series against Atlanta, when he averaged 25.8 points. But even when he struggles offensively, Beal always stays engaged defensively, as he’s often assigned to the opposing backcourt scorer. During Washington’s game-breaking 26-point run in a 42-point third quarter, Wall had 13 points and five assists, and Beal added 11 points as the Wizards shot 65 percent. Brooks called it the best stretch of basketball the Wizards have played this season. That brings us to a clean slate in a best-of-three series. Boston, the top seed in the East, can bank on having perhaps two of those games at home, where Thomas has been unstoppable with a combined 86 points. Washington, the No. 4 seed that’s probably better suited to match up against Cleveland in the finals of the LeBron James Invitational, will need at least two more big games from its backcourt. We all know Wall is capable of being a caped crusader. He’ll just need his sidekick for the Wizards to advance.